The concept of SWYP is simple and easy to understand. But like most simple products, the simplicity is skin deep – literally! There is an incredibly complex system squeezed into the ½ millimeter space between the outer skins of the SWYP card. It has been quite a technological challenge, making it both exciting and nerve-wracking at the same time. In this post, I would like to give a glimpse of the complexity under the hood. Many of you have asked what’s taking so long, and I hope this post sheds some light on that. Of course, I am deeply aware of the frustration and personally apologize for the delays. I can promise you that our team is working day and night to get production ramped up as fast as possible, without compromising on quality. 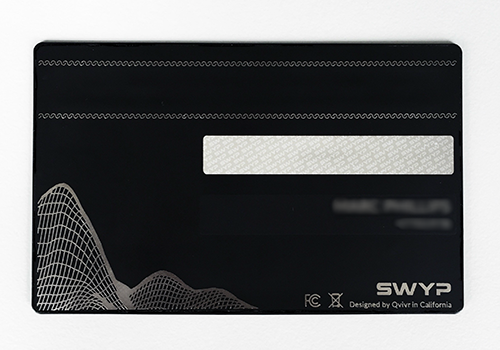 The SWYP card brings mobile payments to the card form-factor. This means that an entire low-power computer needs to fit inside the card: microprocessor, display, buttons, power, radio, and our dynamic magnetic stripe. The credit card form-factor is precisely defined as 3.375 ×2.125 in and 30/1000 inches (30 mils, in short) thick. That is just under 8 human hair in thickness! Thickness, flexibility, and robustness have been the three most challenging aspects of the SWYP card design. In order for the card to be 30 mils thick, all the electronic components must fit within 20 mils. Finding components thin enough to fit in the card has not been simple. When we started designing the SWYP card, some of the components were mere markers on our suppliers’ roadmap slides, other were non-existent. The latter, we had to design ourselves and work with manufacturers to have them produced at scale. Fortunately, most of our vendors delivered on their promises, albeit a bit later than we thought. We had experience building flexible PCBs before. But flexible displays and batteries (see picture below) were a different ball game altogether. Fortunately, recent advances in technology have led to solutions that have just started ramping up earlier this year. This means that we are on the bleeding edge of technology, but it also means that any hiccups at our suppliers are exposed to our customers. Not ideal, but the cost of building a truly advanced product. With thickness and flexibility taken care of, we needed to focus on robustness. Remember, the SWYP card could sit in a wallet in someone’s back pocket and had to withstand the stress and flex. We came up with a really cool metal design that not only protected the fragile electronics inside the card, but gave it a very sophisticated look. The first generation SWYP card has nearly 150 different components sourced from more than 25 vendors across three continents. As part of our R&D process, our parts have moved a million miles across the world. If there was a way to transfer that mileage to me, I would be traveling first class for a long time to come! While our components come from all over the world, we made a decision to keep early manufacturing in the US, specifically in Silicon Valley. It has provided us with a lot of flexibility in the early days of product development and manufacturing. More importantly, it has helped us execute revisions and improvements to the design quickly. It is gratifying to see all these technologies coming together in the final product. We are proud to have built the first connected card with a full matrix display and metal finish that can consolidate as many as 25 cards. I know the journey has taken longer than we had originally anticipated, but we really are relying on technology that is just coming of age. I am grateful for the continued support, feedback, and patience as we progress towards this goal. We would not be here without our early adopter community and our terrific investors.